We are serious about your brand. We help you grow it. Qikink prints on demand and delivers orders to your customers. We know that you want to create a wow experience for your customers. We truly understand that and working towards making it happen in every single delivery. We expect your brand should be loud enough to be better experienced by your customers. We create unique branding options to be used by your brand. You can design and sell T-shirts and various other products from Qikink, it will be printed on-demand and fulfilled with your own brand displayed brightly on the product or the package. You can make your brand visible outside the T-Shirts you sell. We can print a label outside the neck area of the T-Shirt. It is the ultimate logo placement to showcase your brand to others via your customers. This is for T-Shirts, Polos, and Sweatshirts. People don’t prefer unbranded shirts, do they?. So, brand your shirts with your own custom designed label with brand name, wash care and what not!. Sell Custom branded T-Shirts with Qikink at ease. You can customize your courier cover to symbolize your brand. You can make covers and send to us or we can custom print courier covers for your brand. For us to create courier covers, use the following specs below. It will take 15-20 working days to stock custom printed covers. Personalise your orders with custom pack-ins of your choice. Be creative in designing and creating a pack in. We can create one and add to your orders as per your design as well. A personalised 6 x 4 Inch Thank you/Coupon Card/Gift Certificate will create a personal touch. You can send the Pack-Ins to us, we will store them and send for free. For us to create Pack-Ins, use the following specs. 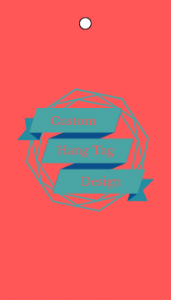 Make your apparels more branded by decorating with a custom hang tag. You can order tags with us with a minimum of 500 pcs. Its been custom printed with a 300 GSM board with your design. We will store them and use for all your apparel orders. How cool is it when your customer receives the courier packet with your brand logo on it. We can print your single colour logo on the courier package for free. Box Packing - Coming Soon! Box Packing for your apparel orders. Show your customers the strength and beauty of the brand by sending the order in a 5 ply cardboard box with your custom branded sticker on it.